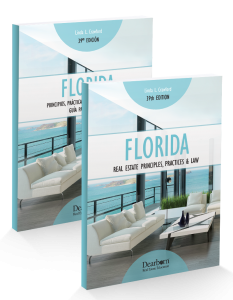 This book set contains Florida Real Estate Principles, Practices & Law and a new Spanish Student Guide. Florida Real Estate Principles, Practices & Law sets the standard for real estate education in Florida. This edition contains major updates to conform with the revised Florida Real Estate Commission (FREC) Sales Associate Course I Syllabus, effective January 1, 2015. Instructor Resources include a complete Instructor Manual with chapter teaching outlines, discussion questions, and classroom exercises. Practice quizzes provide instructors with additional classroom materials for reinforcing important concepts. The Spanish Student Guide, translated into Castillian spanish, is based upon Florida Real Estate Principles, Practices & Law, 39th Edition and consists of the learning objectives, key terms, and summary sections from each unit to help students learn key state-specific real estate concepts.